Shine the spotlight on your entertainment-related business, entertainment venue, or performance event with our Curtain Call sticker design template. Available in three different color options, two shapes, and three distinctive edge finishes, Curtain Call will focus your customer’s attention on your brand. 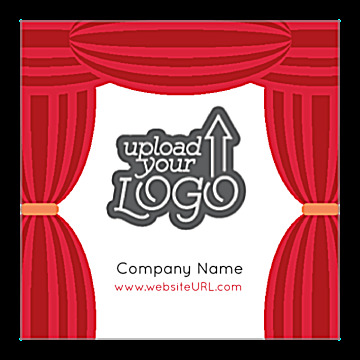 Curtain Call features your company’s logo, company name, and website URL framed by a stage-style curtain. Graphic and text elements can be changed to display whatever information you’d like. Print custom stickers with our online design tool today! Personalize stickers for your business or event with our online sticker maker, which lets you print custom stickers that feature your unique brand. Make your own stickers by first selecting one of our professionally-designed templates. Next choose a color scheme, shape, and edge finish, then add your image and whatever business information you want to include. Easy as ABC, your custom sticker design is print-ready. You can even download a free, shareable PDF to share with team members before printing! PsPrint’s stickers are printed on premium paper stock and high-quality printing on state-of-the-art printing presses. All our products are backed by a 100% customer satisfaction guarantee, so you can trust that you’ll be delighted with your custom stickers when you print with PsPrint. Custom shiny foil stamps and die-cut sticker shapes can help your sticker, and business, venue, or event, get attention. PsPrint’s custom printing services can help you print the perfect personalized sticker! And, don’t forget, if you need other print marketing tools we offer a full suite including business cards, postcards, flyers, and more.